There’s really no such thing as a typical ski patroller. Nevertheless, when you hear the words “Ski Patroller,” you probably think of someone performing a mountainside rescue of an injured skier. The truth is, it takes all kinds to make this team. Emergency care is an important part of the mission of the National Ski Patrol – the world’s largest winter rescue organization. But it’s just one way patroller’s help skiers. We educate. We communicate. We participate! National Ski Patrol members are people with a strong desire to help others. People who want to learn – and use – emergency care skills, improve their skiing, and help make skiing safer for all. 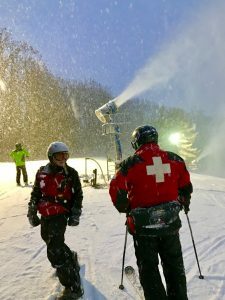 The National Ski Patrol (NSP) is a Federally Chartered nonprofit membership association dedicated to serving the public and the snow sports industry by providing education services focusing on outdoor emergency care and safety. For more than 55 years, the NSP has been at the forefront of safety and emergency care education programs. The association’s 28,500 members represent 98 percent of the nation’s patrollers, whether or not they are paid by or volunteer for their home area. These members, through NSP’s award-winning Outdoor Emergency Care program, are the principal delivery system of emergency care training for ski area patrollers. NSP also develops training for non-medical roles, including toboggan handling, avalanche search and rescue, mountaineering, mountain host programs, and more. NSP also reaches members through nationally funded education materials and programs, division newsletters, and local clinics. Through its divisions, NSP conducts training events to supplement training provided by the ski areas. This cooperative effort ensures that members are serving the needs of area management while staying in tune with a nationally standardized system. The Ohio Region is one of 8 regions in the Central Division and has 10 member patrols in Ohio and Southeastern Indiana. A primary role of the ski patroller is to provide emergency care for injured and ill skiers – both on the mountain and in the patrol room. By joining the National Ski Patrol, you’ll receive extensive training in Outdoor Emergency Care, an intensive course specifically oriented toward patrol and ski area management needs. You’ll also become proficient at life-saving medical techniques. Eventually, you’ll be prepared to treat injuries and illnesses with a high degree of expertise and confidence. One day, this training may help save a life – on or off the mountain. The Ohio Region has 10 member Alpine and Nordic ski patrols. They are located throughout Ohio and South Eastern Indiana. The map shows their general locations. This is a Google map, so you may have to expand/contract the view in order to see all of the red crosses. If you are interested in finding out more about an individual ski patrol, select one of the red crosses on the map and paste the link into your browser in order to view the patrol’s website. Skiing and snowboarding can be enjoyed in many ways. At areas, you may see people using alpine skis, snowboards, telemark skis, cross-country skis, and other specialized equipment, such as that used by the disabled. Regardless of how you decide to enjoy the slopes, always show courtesy to others and be aware that there are elements of risk in skiing that common sense and personal awareness can help reduce. Observe the code listed below and share with other skiers and riders the responsibility for a great skiing experience.